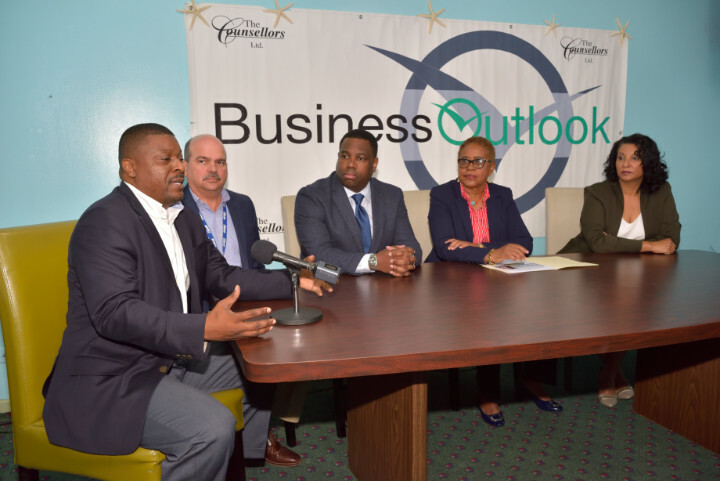 "The 20th Grand Bahama Business Outlook (GBBO), is set to take place on February 22, 2018 at The Grand Lucayan Resort. This year's event will bring together experts from a cross-section of fields with the common goal of sharing the key ingredients needed to improve the Grand Bahamian economy." (Pictured L-R: Zhivago Laing, Radio Talk Show Host, Z Live: Off The Record; Andre Knowles, BTC Chief Commercial Officer; KPMG Head of Management for Consulting and Data Analytics, Dennis D Deveaux; Joan Albury, President of TCL and founder of the seven-island Business Outlook Series and Bahamas Power and Light (BPL) Chief Operating Officer Christina Alston)." The 20th Grand Bahama Business Outlook (GBBO), set for February 22, 2018, is bringing together public and private sector experts who will share key elements for the revitalization of the Grand Bahama economy, ranging from energy to technology solutions. The event will be held at The Grand Lucayan Resort featuring Deputy Prime Minister and Minister of Parliament for East Grand Bahama, K. Peter Turnquest as the keynote speaker. Speaking at a press conference held at TCL Group’s headquarters, Joan Albury, President of TCL and founder of the seven-island Business Outlook Series, said she has high hopes that this year’s GBBO team of speakers will help answer the more than 10-year old question as to how to eliminate the Grand Bahamian business drought. moderate the day-long programme and give the “Vision” presentation. Other forum speakers at GBBO will include: Sen. Hon. Kwasi Thompson, Minister for Grand Bahama; Mick Holding, President, Grand Bahama Chamber of Commerce; Ian Rolle, President, Grand Bahama Port Authority; Bahamas Power and Light (BPL) Chief Operating Officer Christina Alston; KPMG Head of Management for Consulting and Data Analytics, Dennis D Deveaux; Erica Paine, Partner and Head of Graham Thompson’s Grand Bahama Office; Charlene Lewis-Small, Lead Investment Officer, IDB and Paul Wynn, Chief Executive Officer, The Wynn Group and Andre Knowles, BTC Chief Commercial Officer. “What I am going to be talking about first of all is what might be the ingredients of that vision for Grand Bahama,” Zhivargo Laing said. “What is it about that place that we could actually be seeking to pursue? The BPL chief, Mrs Alston said her presentation will be centered around the country’s energy supply and how to reduce its carbon footprint according to global standards. Andre Knowles said that the telecommunications company is proud to partner with GBBO given its importance to the Grand Bahama community. “We feel that we are an intrinsic part of the ingredient that is needed to facilitate business development and that is providing the right infrastructure. I will be speaking about the smart city concept, how we are able to utilize the new on-going infrastructure that businesses require,” Mr Knowles said. KPMG’s Head of Management for Consulting and Data Analytics, Dennis D Deveaux said there are three important aspects that he plans to share at the Outlook to assist businesses in connecting with foreign investors, especially on the digital level. Interested persons are encouraged to register at www.tclevents.com or contact Mercynth Ferguson of Grand Bahama Chamber of Commerce at 242-352-8329 or Email: info@gbchamber.org.